Taglines: We're All Works In Progress. I've lived without a father my entire life. He hasn't passed away and isn't comatose or medically disabled. He just had no interest in being a part of my life until I turned eighteen. Then his view on me changed, but it was too little too late. Even when he was around the first few years of my life, he actively showed that I didn't matter to him. That entire experience is perhaps what helped me relate to Being Flynn the most. While drugs or alcohol were never much of an issue, the strained relationship between a father and son is something I understand all too well. Nick Flynn (Paul Dano) has always been in his father's shadow even though he was never around. Nick's father Jonathan (Robert De Niro) is a conman, a liar, and the self-proclaimed greatest writer in the world. As an adult, Nick is struggling to find his place in life. His never ending search to find a job that means something along with putting at least some effort into becoming a writer himself is taking its toll on him. 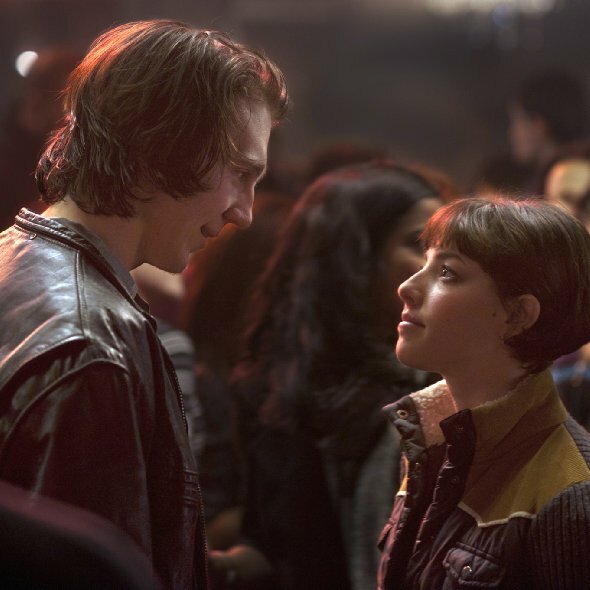 He finally starts putting his life back on track; he finds a new place to live, he gets a job at a homeless shelter, and even starts dating a girl named Denise (Olivia Thirlby) who also works at the shelter. That's when fate intervenes and Jonathan re-enters the picture. Despite never being there for him growing up and only having over a hundred letters written by his father to fall back on, Nick struggles with either giving his dad one final shot or pushing him away for good. 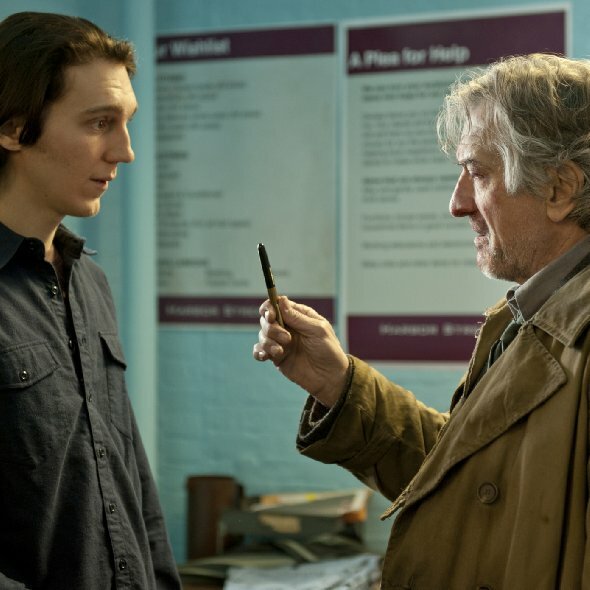 Paul Dano is rarely ever disappointing, but Robert De Niro has been slipping in his most recent cinematic outings. 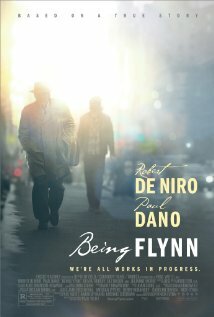 The great thing about Being Flynn is that this is the best De Niro performance in years. His anger and racism towards people he doesn't understand, his delusions of becoming a great writer and his slow downward spiral into violent dementia are really powerful and De Niro portrays all of it exceptionally well. Yet it's still bittersweet to see De Niro driving away in a taxi cab in the opening scene to the film. Meanwhile Dano's struggle with following in his father's footsteps is also fantastic in this train wreck kind of way. Their chemistry together (or lack thereof) is perhaps the biggest driving factor of the film. The dual narrative was a unique touch. This is very much Nick's story, but it's constantly jumping back and forth between his words and Jonathan's. Hearing the same story be told simultaneously from two different individuals was pretty fascinating. Being Flynn is a pretty gloomy little drama sprinkled with bits of messed up comedy throughout. The humor is dark and dry and nobody in the film is an upstanding citizen. It's as if the film is trying to tell you that everyone has their own demons and everyone has some messed up quality to them in some capacity. There's this one shot of Jonathan curling up on a grate that's blowing warm air on a freezing night that sticks with you after the film ends. You're eventually looking down at Jonathan; all bundled up as the camera slowly ascends to the heavens. The scene of Nick playing catch as a young boy with all of the boyfriends his mom had over the years was fantastic, as well. The way the camera goes back and forth, a different boyfriend being at the other end of the glove every time we pan away from Nick, and finally the way Jonathan was never there to do it himself. Mirrors are also really important as they not only cause these characters to look inward, but both Paul Dano and Robert De Niro have some pretty memorable scenes standing in front of a mirror. Lastly, the violins are astounding. Rhythmic and their tendency to start soft and get louder add this aspect to the film that wouldn't have been accomplished with different music or none at all. 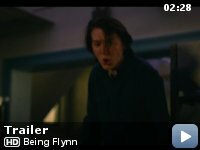 Being Flynn isn't an easy film to access, but will more than likely touch you in some way or form if you grew up with any sort of parental issues. 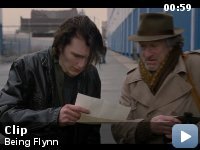 With the expected strong performance from Paul Dano and the unexpected great performance from Robert De Niro, Being Flynn allows you to witness the troublesome times of an individual, destroy themselves because of it, and eventually rebuild themselves for the better. In a way, it's the most depressing self-help method to ever hit the screen, but that's what makes it so easy to relate to and unlike whatever you expected this film to be.